You may have read my blog post “Jewelry in the Movies: A 1930s Art Deco Necklace”, in which I identified this necklace as the same as that worn by one of the characters in the 2017 movie Murder on the Orient Express. 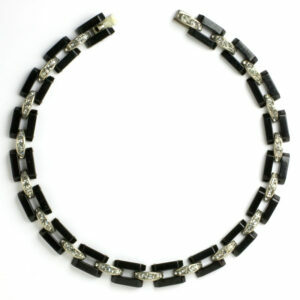 When I described the piece, I told you that it was a black Bakelite and diamanté German necklace, circa 1933. 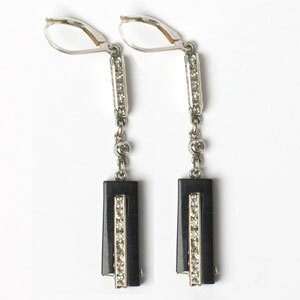 The black rectangles are connected with tapered, curved silver-tone links that each hold five rhinestones. One of the links is marked “DRGM 1138525” on the back. I also told you that DRGM is an abbreviation for the German patent mark (Deutsches Reichs Gebrauchsmuster). It is NOT the maker’s name. So, who made the necklace? When I wrote that article, I knew the name of the company, but I withheld it because I wasn’t ready to tell their story. My research wasn’t complete, but it is now. Once again, my good friend and colleague Robin Deutsch and I have pooled our resources to introduce you to an important costume jewelry maker whose creations you may have seen but whose name you’ve probably never heard. The key to this puzzle is in the links. The German utility patent with the number 1 138 525 applies to an oblong metal link that was designed to form the channel setting for round stones. This patent was registered to Schreiber & Hiller, a jewelry manufacturer in Pforzheim, Germany. The only surviving record in the German Patent and Trade Mark Office is the extract, which names the patent holder and provides the application date (September 6, 1930), the issue date (September 24, 1930), and a description of the utility (Gliederbandkörper für Schmuckzwecke – a flexible bracelet for jewellery). Unfortunately, technical drawings and the specification (the detailed description) are not included. The same invention was patented in the former Czechoslovakia – number 43225. That application was filed in October 1930, and the patent was issued in April 1933. This document does include the technical drawings and description, but neither of us can read the language. Luckily, a U.S. patent was issued to August Hiller of Pforzheim, Germany, on January 2, 1934, for a Band for Jewelry Purposes. Patent number 1,941,684 cites the application date in the U.S. (December 15, 1930) as well as that in Germany (September 6, 1930). So, we know that the U.S. patent was for the same invention. And we could take advantage of the technical drawings and the description in English. The specification states: “This invention relates to an articulated band, which has a raised surface of any shape, which is completely set with jewels”. 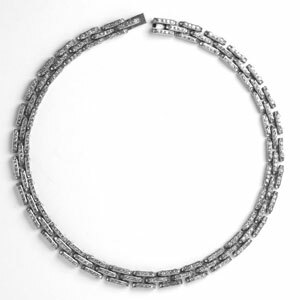 The articulated band is composed of individual links, each formed by a metal box that surrounds and holds a row of jewels in place in the center. The shape of the link is determined by the shape of the upper edge of the setting. The first page of the patent appears below. Figs. 2 to 4 in the technical drawings illustrate links in three different shapes, each with a different number of stones. Hiller called the style of link in fig. 2 “roof-shaped”. We’ve named fig. 3 “flat-top” and fig. 4 “curved”. Fig. 1. 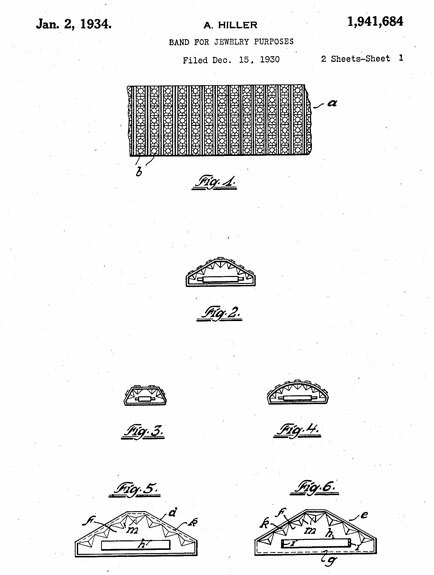 U.S. patent 1,941,684 issued to August Hiller. In the 1930s, Schreiber & Hiller produced a stunning array of bracelets, necklaces, earrings, and brooches by varying the shape of links and their surfaces, the size of links, the patterns of connection, the colors of stones, and the types of materials. What follows is a selection of pieces that illustrate these differences. 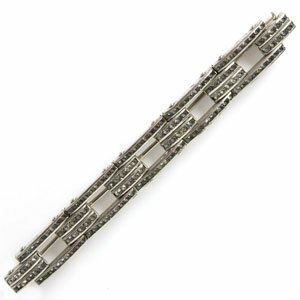 You can see TruFaux Jewels’ Schreiber & Hiller collection here. Fig. 2 shows a bracelet with roof-shaped links; i.e., the surface created by the stone-setting is pointed. The link bottoms are flat and oblong in shape; the sides are flat and just high enough to hold the stone on each end. 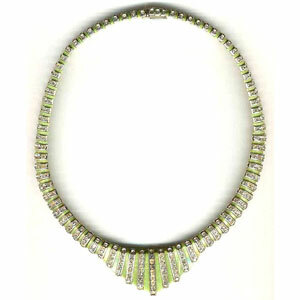 In this piece, the pattern is three links of diamanté followed by one link of emerald. Fig. 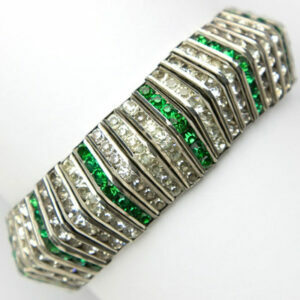 2: Bracelet of emerald and diamanté links with pointed tops. 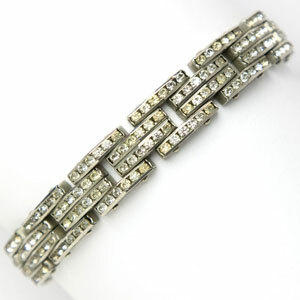 This bracelet is substantial at ¾” wide and has seven large stones in each link – one at the peak, and three down each side. In addition to “DRGM 1138525”, this piece is also marked “PAT 396100”. This number corresponds to a German utility patent granted in 1924 to the firm of Philipp Döppenschmitt, also located in Pforzheim, for a mesh band to connect links in jewelry. The pieces in fig. 3 and 4 have flat-top links. The bottoms are flat and oblong; from the side, the links are trapezoid-shaped. The necklaces, bracelet, and earrings in fig. 3 all have vertical links of diamanté alternating with Bakelite. In the first necklace (left), the Bakelite is pale green. The earrings in the center and necklace-and-bracelet set (right) have black Bakelite. Fig. 3: Necklaces, bracelet, and earrings with vertical links and Bakelite. Left necklace and right set courtesy of Cathy Gordon. The three pieces in fig. 4 all have horizontal links in the tank-track pattern that was so popular in the 1930s. The diamanté and sapphire bracelet (left) is the same pattern as the all-diamanté necklace in the middle. 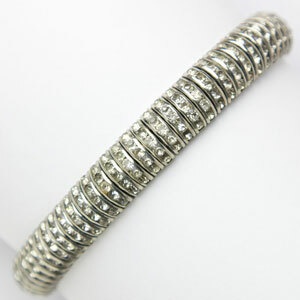 The bracelet on the right is a variation, with two rows in the center instead of one. Fig. 4: Bracelets and necklace with flat-top links. Fig. 5 shows a brooch (left) and bracelet (center) composed of vertical links with oblong, flat bottoms and settings that form half-domes. The second brooch, on the right, has slender links with curved bottoms and tops on each outer row. Fig. 5: Bracelet (courtesy of Barbara Schwartz) and two brooches with curved-top links. The three necklaces shown in fig. 6 are variations on the tank-track design. All three have links that are slightly-curved units. The links in the first and third pieces are tapered at the ends. 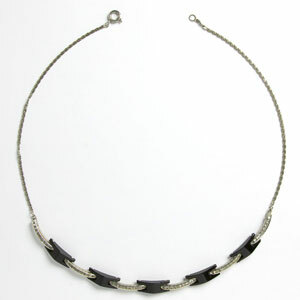 The middle necklace has black Bakelite roof-shaped links that alternate with the gem-set links. The center section (without the chain) forms a curve. 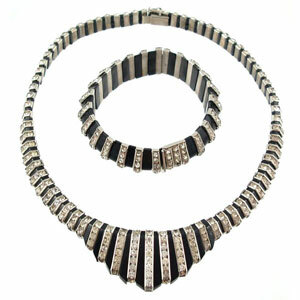 The necklace on the right features a black Bakelite disk topped with prong-set diamanté surrounding a larger stone. The jewels in fig. 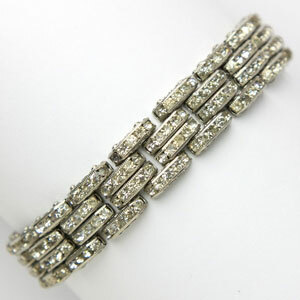 7 are examples of more sophisticated designs that are still based on the channel-set jeweled link. 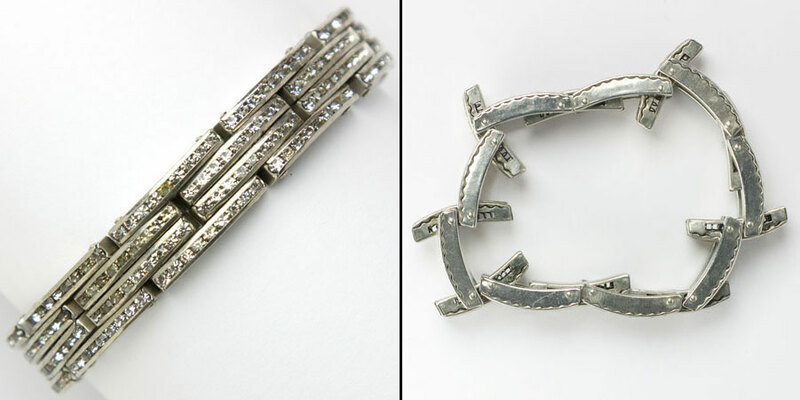 The circle brooch on the left has black diamanté set in curved links with claw-set white diamanté embellishments. This piece is the most ornate that I have seen. 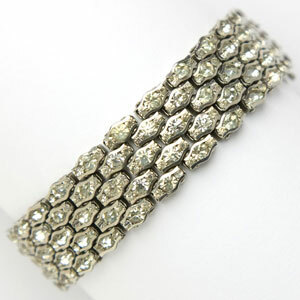 In the center is a five-row bracelet with honeycomb-shaped links, each with a trio of stones – a larger one in the middle, flanked by a smaller one on each side. On the right is our favorite: a dress clip adorned with fruit salads. Fig. 7: Circle brooch, honeycomb bracelet, and fruit-salad dress clip. The clip is courtesy of Barbara Schwartz. Let’s look now at the company behind these fabulous jewels. Schreiber & Hiller (“S&H”) was founded in 1920 by Rudolf Friedrich Schreiber (1874 – 1944) and August Hiller (1872 – 1939) at 66 Kronprinzenstraße in Pforzheim, as manufacturers of jewelry and chains. We have been unable to find information about the firm’s operations before patent number 1138525 was registered in 1930. A search of Deutsche Goldschmiede-Zietung, the German jewelry trade publication, did not reveal any advertisements in the 1930s. Little is known about S&H’s operations from the beginning of World War II (1939 in Europe) until 1953, when a patent application was filed in Germany. Although Pforzheim had been the country’s center of jewelry manufacture and watch-making since 1767, war-related production took over those factories to a large extent. The city itself was heavily bombed by the British in 1945 and wasn’t able to resume its position as a leader in the jewelry and watch-making industries until 1950. The company’s chronology doesn’t pick up again until 1946. By then, Ottilie Schreiber (1877 – 1968), Rudolph’s widow, and Leonore Grießmayer (née Hiller) were registered owners of the firm located at 10 Simmlerstraße in Pforzheim. Anni Haubensak, Ilse Stoll (née Grießmayer) and Dieter Grießmayer joined as co-owners in 1957. The 1950s seemed to mark a new beginning for the firm. While S&H did not use a maker’s mark on the 1930s jewelry stamped “DRGM 1138525”, that practice changed after the war. Their application for the first trademark was filed in June 1950 in Germany and granted in August 1952. 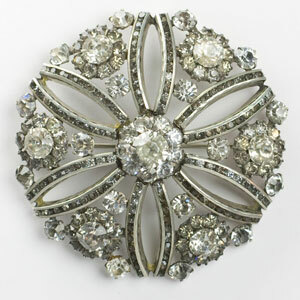 This mark has been seen by many collectors of vintage costume jewelry. Fig. 8: First trademark filed in Germany in 1950. The mark has often been mis-interpreted as a person’s name and referred to as the designer’s name. Instead of reading the letters as a word (pronounced ey-sha), the mark should be read as es-ha, which is how the letters “S” and “H” (for the company’s name) are pronounced in German. The trademark publication states that this mark is for Echte und unechte Schmucksachen, insbesondere Simili- und Modeschmuck (Real and false jewelry, especially simulated and costume jewelry). The application for a second trademark was filed in November 1953 and issued in July 1954 in Germany. This mark is also familiar to many collectors and has also been mis-interpreted as a person’s name. Many people writing about this company’s jewelry with these maker’s marks incorrectly refer to “Esha Randel” as the designer. Those trademarks DO NOT form a person’s name. Interestingly, this trademark was also registered in the U.S. in 1956 (the application was filed in 1954). That mark is shown in all capital letters, which is how the stamp appears on the jewelry. Both registrations are for “costume jewelry made of silver and watch bands made of metal”. Fig. 9: Second trademark filed in Germany in 1953 (left) and U.S. trademark filed in 1954 (right). Fig. 10 shows a bracelet that bears both maker’s marks: “ESHA” in a semi-circle and “RANDEL”. If you didn’t see them, you would think this piece with its tank-track design and roof-shaped links had been made in the 1930s. Fig. 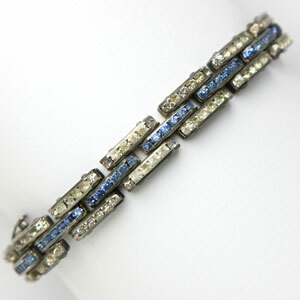 10: 1950s tank-track bracelet. Patent applications were filed in Germany (in 1951), France (in 1952), and Great Britain (in 1953) for the same invention. Although we can read only the text for Great Britain number 731,231, the technical drawings in the document are the same as those in the German (number 912 403) and French (number 1.062.359) patents. Fig. 11 shows the technical drawing for this invention. The patents were issued in Germany in 1954; in France, 1953; and in Great Britain, 1955. Fig. 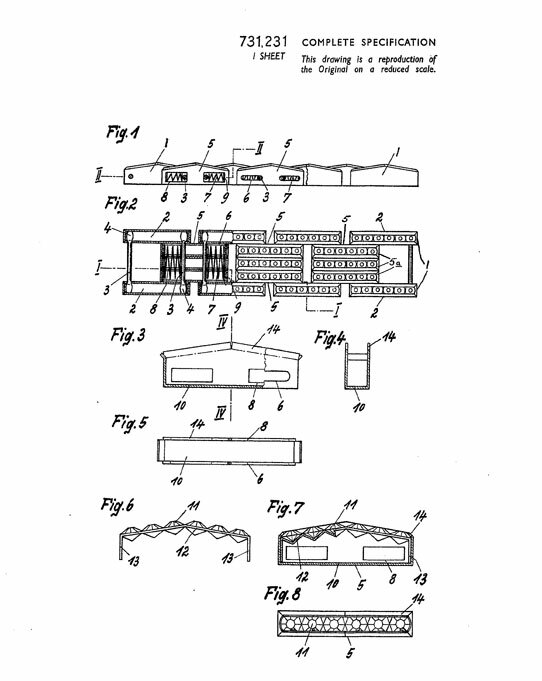 11: Great Britain patent number 731,231 for “Improvements in or relating to Link-Bands”. In this technical drawing, the last three figures show a stone mounting very similar to that of the original patent 1138525. The second figure illustrates how the links would be arranged and connected with springs to allow the bracelet to stretch. Here is an example of this type of bracelet, shown in fig. 12. The photo on the right is a view from the top of the bracelet, to give you an idea of its construction. The links that are turned out have springs in them. Fig. 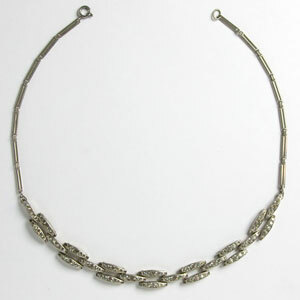 12: Stretchable tank-track bracelet from the 1950s. This piece is marked “ESHA” in a semi-circle and “RANDEL”. It also has a third trademark – “SIMEX” – which was applied for in September 1952 and registered in December 1953 in Germany. The trademark publication states that the mark is for Schmuckwaren, insbesondere Schmuckarmbänder (jewelry, especially jewelry bracelets). Fig 13: 1952 German trademark for jewelry bracelets. Schreiber & Hiller were granted at least 13 more jewelry-related inventions in Germany and one more in Great Britain in the 1950s. These inventions included ear clips, chains, and stone settings. These patents can be found on the Global Patent Index website. I was unable to find any S&H ads in 1930s jewelry trade or fashion magazines. However, searching the 1950s was more fruitful. This ad appeared in the October 1953 issue of Deutsche Goldschmiede-Zeitung (“DGZ”), the German jewelry trade publication. It ran the full width of the page. This ad was the earliest I could find. Fig. 14: 1953 Deutsche Goldschmiede-Zeitung ad. Following its publication, S&H advertised regularly in DGZ through the 1950s, but in a much more modest format. Several pages at the end of each issue were devoted to what we might call “business card ads” today. The smallest size, which was chosen by S&H, fit 28 to a page – seven from top to bottom and four across. The ad on the left appeared in 1954 and 1955; the one on the right ran from 1956 through 1959. Fig. 15: Deutsche Goldschmiede-Zeitung ads, 1954-1955 and 1956-1959. Following World War II, German companies needed to re-establish trade relations with their pre-war trade partners. Exports were a significant sector of the country’s economy. In November 1947, five German business leaders visited the U.S. for the first time since the start of the war. A New York Times article on November 9 quoted one businessman who stated that the jewelry industry in Pforzheim was “40 per cent behind its pre-war capacity, and that it was exporting to Switzerland only”. In April 1949, 500 German manufacturers took their wares to the first post-war exhibition of German merchandise, at Rockefeller Center in New York City. Schreiber & Hiller were among the 26 exhibitors from Pforzheim (that number was reported by Women’s Wear Daily on April 29, 1949). Although a catalog from that event was available, we have not seen it. Robin found evidence of the continuation of this type of trade show, while researching Knoll & Pregizer, her specialty. In 2009, she bought the Atlanta Post: Journal of the International Trade. It is a catalog from a 1953 trade show, with new merchandise – including jewelry, luxury items, eyewear, leather, and china – produced by German manufacturers. The last pages, which contain the descriptions of the items in the catalog, were printed in Spanish. South America was an important trade partner for Germany. 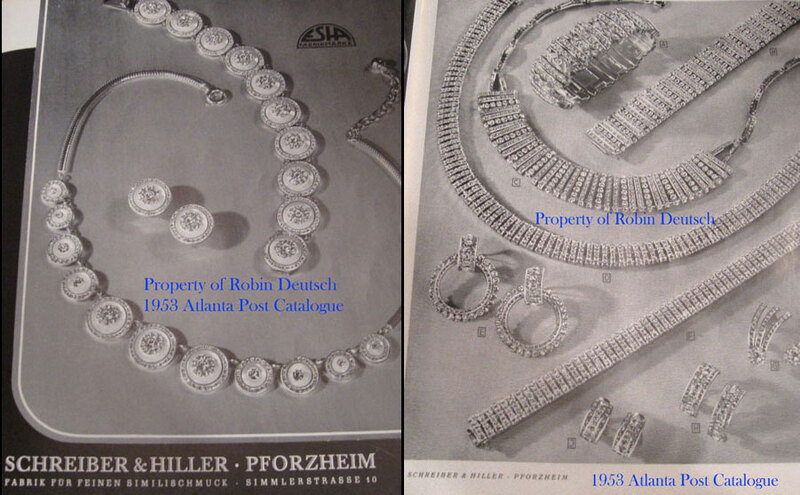 These pages from the catalog illustrate jewelry designs by Schreiber & Hiller. Robin discovered that the “ESHA” maker’s mark belonged to that company when she saw these images for the first time. In the image on the left, note the adjustable clasp on the necklace – a spring-ring instead of the J-hook we’re so used to seeing in North America. I have seen the type of clasp depicted here in many 1950s ads in the German jewelry trade publication, so I assume it was typically used by makers in that country. Also of note in this image is the design of these pieces – neither of us has ever seen anything like this parure. Fig. 16: 1953 Atlanta Post Catalog. Periodically, DGZ published drawings and photographs of new designs from various jewelry makers. We assume that the companies submitted their artwork and that the editors selected what would be featured. I found a partial photograph of the catalog page on the right in fig. 16, in the October 1953 issue of DGZ. Schreiber & Hiller continued to operate until December 1993, under the sole ownership of Dieter Grießmayer from 1961 on. Our telling of their story ends with 1960, because the focus of my research and collecting is the 1920s through the 1950s. 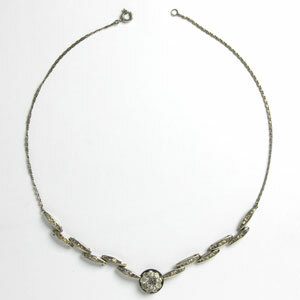 All jewelry marked “DRGM 1138525” was made by Schreiber & Hiller in the 1930s. Esha Randel was NOT a person. We wish to thank the staff of Stadtarchiv Pforzheim who provided information on their holdings pertaining to this company, details about the ownership of Schreiber & Hiller, and general information about the jewelry industry in Pforzheim. I am grateful for their prompt and gracious responses to my many questions and their interest in this article. We also wish to thank the German Patent and Trade Mark Office for guidance in searching the Trade Mark Journal and for providing this important resource online. Barbara Schwartz is a costume jewelry historian and a tenacious and passionate researcher. She is also the founder of TruFaux Jewels, an online boutique of exquisite costume jewelry made in Europe and North America from the 1920s – 1950s. She is a member of the Association for the Study of Jewelry and Related Arts and the Vintage Fashion Guild (VFG). Barbara has lectured on fashion and jewelry history for the Association of Image Consultants International, at two conventions of Costume Jewelry Collectors International (CJCI), as part of the Jewelry History Series at The Original Miami Antique Show, and at The Antique Jewelry & Art Conference. Her articles have been published online by CJCI, Kovels, Vintage Dancer, and Sixty and Me, and in The VFG News and ADORNMENT: The Magazine of Jewelry & Related Arts. Her own interesting story has also been featured on The Story Exchange. Robin Deutsch has been a jewelry historian and collector since the 1990s. 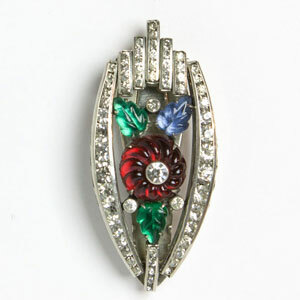 She specializes in American and European costume jewelry, focusing mainly on Art Deco and paste of the 1920s –1930s, but she collects anything from Georgian to made-yesterday. She is a member of many fine and costume jewelry organizations and has had many costume jewelry articles published online at CJCI and also in VFCJ Magazine. Robin has her own website on the German jewelry company Knoll & Pregizer which she published in 2009, bringing to the forefront the name and history of this company that was lost to posterity. She was a lender to the museum exhibit “Finer Things” at Stan Hywet Hall & Gardens, Akron, Ohio, April-October 2012.